Being the purchasing parent, I got to play the Waste Your Money game with Disney. I like The Wiggles, I have no problem sitting through hours of Wiggley fun, but goodness gracious Disney Interactive! How could you allow this to be put on the market - for 20 dollars no less? My son actually said to me, "Daddy, it's not doing nothing?" (I'll work on his use of double-negatives later) Uhh, Merry Christmas Son?!? It offers NO stimulation for the childs mind and has NO entertainment value. Basically, it's the PC game equivalent of a cardboard cut-out. Let me give you an example of how bad it is: You can choose to watch three little Wiggles video clips, well, the problem is when The Wiggles sing their mouths don't match-up to the song being played - none of the three videos are in sync! I mean seriously people?!? The one good thing about Wiggle Bay is that it gets my son off the computer. Now THAT'S worth 20 dollars. Trust me when I say, don't waste your money, this game is not worth it no matter how much of a Wiggle fan your child is. My son is a huge fan so I got this for him thinking it would be the perfect thing to introduce him to the computer. After we played each game just one time he was bored and wanted to get down to go play and that isn't like him when it comes to anything dealing with The Wiggles, he eats, breathes, and sleeps The Wiggles. Should have been called "Dorothy's Cheap Mini-Games"
The voice of Dorothy the Dinosaur provides instructions as you navigate around an island-shaped menu of 8 mini-games. Unfortunately, the games themselves (Tic-Tac-Toe, simple jigsaw puzzles and mazes, etc.) are very short, unimaginative and look cheap. They are of the quality that you can easily find for free on websites like Nick Jr., Playhouse Disney, or PBS Kids. One of menu options isn't even a game at all - it's just 3 short clips from the "Wiggle Bay" video. Another game where you water four of Dorothy's flowers, is actually quite frustrating -- each plant starts dying if you remove the water for more than a split-second, so the only way to get them all to bloom is to be in a ridiculous constant motion. 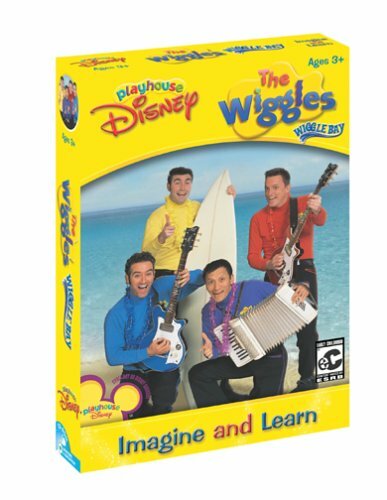 And besides those three video clips, the Wiggles themselves are barely present at all in the game. Comic-book-style renderings of their faces appear on the screen, and you'll hear an occasional "Hi I'm Jeff" or "You're very good at this game", but Dorothy is the voice who provides all the instructions. Overall, a very disappointing product. This is not high quality software.The program is slow and to simple even for my 18 month old daughter.I have a top of the line Gateway computer,and I have never seen anything move as slow as this.She loves the Wiggles so I feel we got are moneys worth she can look at the one of the three videos included in the software ( they are only small pieces). I thought we would get a better program with Disney names on the product. I was impressed with the animation and graphics for this game and even more so the storyline and tasks that motivate kids to want to reach the goal - doing every task in the "city" (to help the merchants with math) so the arcade can open and the player can spend the money he or she has "earned" to play games. My daughter(5 yrs. )is so hooked and her math skills really improved. You can even track your child's progress. My only criticism is that it was a tad bit hard to navigate and figure out how close to the goal she was. Engaging and makes practical math fun. My four year old daughter loves this game and would play it every day for hours if I let her. She has really developed some advanced skills just by having a good time. Some of the games require more support from me than others, but overall she is able to do more and more by herself and is definitely learning. I usually type in a new name each time we play so she has to start over with all the math games before she can use the arcade. She loves it so that's no problem. One extra is that there are girl characters on the program, which I appreciate for my daughter. Pajama Sam: Games to Play on Any Day has no 3-D graphics, nospecial effects, and no gimmicks. It's excellent. This refreshing program puts aclever Humongous Entertainment spin on remakes of classic games. Remember whenkids pulled checkers and Parcheesi out of the closet on a rainy day instead ofpowering up the Game Boy? This CD-ROM evokes that feeling so completely, it'seasy to forget these board games are taking place onscreen instead of on theliving-room floor. The first treat is that no installation is necessary, since these games rundirectly from disc. After an animated sequence that features Pajama Samrummaging through that game closet on a drearily wet day, players arrive at asimple screen where there are nine different games to choose from. Here playerscan also pick one of three levels of difficulty, and whether they want to playthe computer or a fellow human being. There's even a demo mode for folks whohave been playing so much Super Mario they've forgotten how to playcheckers. The games have names like Jumping Beans, Fans and Teleporters, and 4 CheesePizza, but don't be fooled. You'll be playing checkers, Chutes and Ladders, andsomething similar to Aggravation, yet not so close as to inspire a lawsuit fromMilton Bradley. This program also contains versions of Concentration(Concentrate! ), and tic-tac-toe (Cheese and Crackers). Our favorite was afamiliar-feeling game called Happy Fun Squares where we linked dots with lines,eventually building squares, against a character named Darkness. Even on theeasy level, Darkness managed to be an enjoyable opponent, amass squares withfrightening efficiency, and whup us thoroughly. 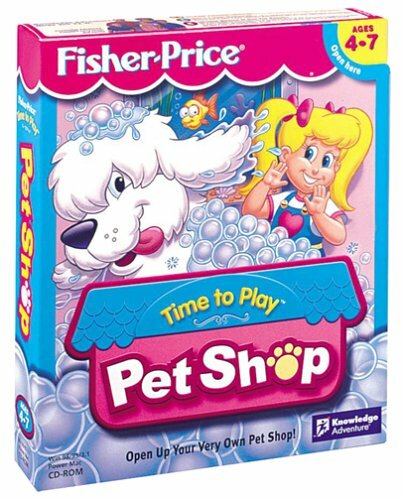 This is absolutely the best set of kids' computer games except for PuttPutt's Activity Pack (same company)! We have most of PuttPutt, Freddi Fish, Pajama Sam and Spy Fox, plus the soccer, baseball and football. Not only has my 6 year old been playing them successfully for 3 years, but the neighbor kids up to age 12 come over to play them as well (for the past 3 years). You can't go wrong with any of these products for kids not yet too sophisticated to demand interactive advanced graphics. These are the best, and entirely inoffensive. My kid has all the Freddi Fish , Spy Fox & Pajama Sam titles. My kid loved the games since he was 4 years old. Humongous Entertainment did an excellent job. These games will challenge the intelligence of kids. The sixth Pajama Sam release, this new game doesn't look like it will live up to the others, but it does. There are ten fun new versions of old games. They can be more addicting than the originals, especially if you're a PJ Sam fan! It's a rainy day, and Pajama Sam doesn't know what to do. He looks in the closet for games, and ends up in a world of fun, revisiting with some of his old friends. Because you can't save games, THIS GAME DOESN'T REQUIRE ANY HARD DRIVE SPACE. It will work on practically any computer Windows 95, Mac 7.5.5, or higher, and doesn't need to be installed. It doesn't come with a CD case, just an envelope, but this game stays in my CD-ROM drive all the time because it's so hard to stop playing. 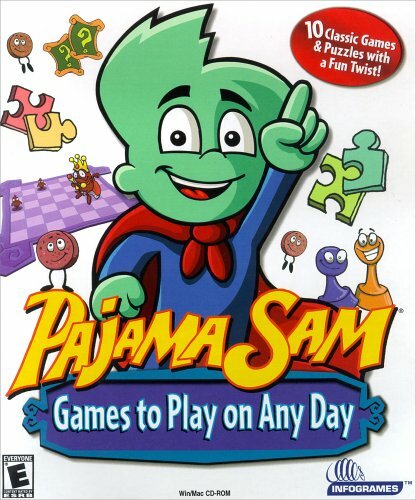 I would recommend this for any Pajama Sam junkee, or just a PJ Sam beginner. Great software for young children! This is a great software program for young children. My five-year old and my three -year old love Pajama Sam. 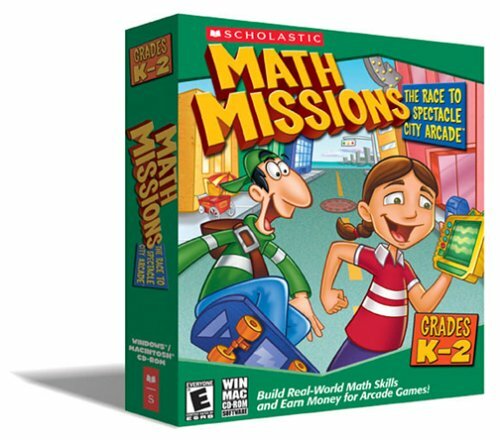 This program teaches critical thinking and problem solving skills in an easy game format. Is the fiercely competitive world of female gymnastics ready for the perkiness of Team Barbie? Once we got over those impossible bodies, we grudgingly realized that Barbie Team Gymnastics would probably be a dream come true for any girl who loves both gymnastics and Barbie. 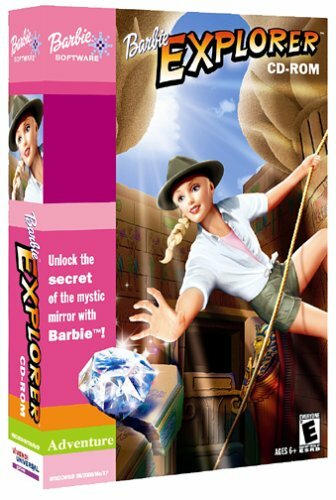 However, don't rely on this game to teach any lessons about sportsmanship: either Team Barbie cheats, or the judges in this program all work for Mattel. Play begins in the lounge, where Barbie and her lithesome yet curvy teammates, Christie and Teresa, await practice orders. Players must guide the girls through practice routines on the vault, uneven bars, balance beam, and floor. Moves are executed by hitting the arrow keys and space bar in a sequence that suddenly appears on the left side of the screen. If a player hits the wrong keys, or doesn't hit the right keys soon enough, their gymnast will bobble or (gasp!) fall off their apparatus, and the coach, Kira, will chirp "Don't give up!" as the program churns relentlessly onward. Maintaining composure after knocking Barbie off the beam is difficult, but just like an actual competition, the good players shake it off and keep going. Young gymnasts will probably enjoy sweating out their mistakes, the realism of the sounds (that hollow thud as hands and feet contact the balance beam), and the 3-D images of gymnasts performing their moves as the "camera" swoops in for different angles. Another nice touch is a replay component that allows players to watch their routines once completed. It's hard to watch the routine as it's being executed, because you must instead keep your eyes on the "Power Bar" that orders the keystrokes for each move. I like this game as much as my 5 1/2 year old daughter. She is a computer game veteran and this one is much different than the others. It took her about 1/2 hour to get the hang of it and now we have so much fun playing. I even like to play it! Hard to tell what it is like from the box description. You use the arrow keys to get barbie and two friends to do gymnastics routines. If you do not move the arrow keys as indicated fast enough you lose points. And you want a perfect 10!! Geared for age 5 and up I would think, I think 5 1/2 or older is best. Doesn't work on Pentium 4 chips! My husband brought this game home for our daughter who loves gymnastics. They installed it and ran all the intro stuff, she was getting very excited by the way-cool graphics. Then we got a message, "CPU Not Supported." A quick trip to the Vivendi Universal website confirms that our processor, the P4, is not supported by this game and that there is no patch available to fix this. Reading the box would not have told us this. The system requirements were Windows 95/98/2000/ME and "Pentiun II processor or higher." Well, P4 is higher than P2, and that chip wasn't released yesterday. I think that's simply unacceptable. My daughter was disappointed, the product is going back to the store, and it's getting one star for not supporting a widely distributed processor. We can't run it on our laptap either because Windows XP isn't supported. Ridiculous! Reviewed 13 April 2004 by mad-haus. Barbie Team Gymnastics is an excellent game for anyone who is a gymnastics fan or loves Barbie. I have always loved watching gymnastics on television and wondered how they performed those big skills, so I went out and bought this game. Your mission is to help Barbie, Christie, and Teresa work their way up to the Nationals and win the team trophy! To play, you start off by choosing the gymnast that you want to practice with, which can be Barbie, Christie, Teresa, or all three of them. You are then taken to the team roster, where you can choose the event you want to go to, or look at the gymnasts' notebooks, which show all of the skills that they have learned. When you are in the practice room, you can create your routine using the skills you know and then practice them with the gymnast to get them correct. If you score on or above the target score that Kyra, your coach, has for you, Kyra will tell you that this routine is ready and you will then do another event. There are four events, vault, beam, floor, and bars, and after you finish practicing the routines and getting them down, you can go to competition! If the team places first in the competition (there are four total), all the gymnasts will recieve new, more difficult and spectacular skills to put in their routines and new leotards to wear in practice and competition, too! The game is so much fun and really helps time to fly by. It is fantastic for any Barbie or gymnastics fan and is quite easy to play, too. We got this computer game for our nearly 3 yr old son, and he LOVES how it says his name! His name is "Baker" so I would assume that if you child does not have a common name that won't make any difference. I didn't actually set this game up, my husband did, so I can't tell you how the name deal was done, but when Big Bird talks to Baker (In Big Bird's voice, not my husband's saying "Baker")he just goes ape. The games are fun and do-able for him. Good choice. My daughter received this as a gift. When we went to play the game the 1st time it did not work. We had to return the 1st cd and wait for a second to be sent to us. When we received the 2nd cd it worked better but still not like other games we have. It is sluggish and skips parts. I had higher expectations of this product - for instance that it would work. We were only able to play it once. The other times we attempted to play the game it would freeze up my computer before we even got through the introduction. I could not install this program on my son's computer (my old computer - Win 95, Pentium II 233, lots of RAM). The program would run and I would not get any sound. I upgraded my audio drivers, still no sound. I contacted customer support and they could not resolve the problem either. So I installed it on my newer laptop and it runs fine, but I would rather that he did not play on my laptop. Otherwise it is a good game and my son loves it. The art cd in this pack is great. You can paint, do stickers, and costumes--all fun and creative. The numbers & letters games are horrible. Essentially the child is wandering around on Sesame street and gets to make a bunch of stuff repeatedly move by clicking on it. There aren't really any games or play of any value embedded in this aimless & boring wandering. Worse, there is a tv in every home the child visists (Big Bird, the Count, etc) & this tv is the main attraction--my son would go to the room (in the game) and ask to watch tv. Just what I needed. 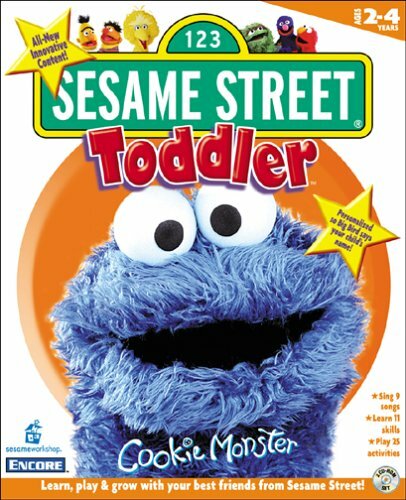 Somehow I disabled the video compont so now all the tvs are broken--this helped some, but I was disappointed in Sesame Street enough to get on here and wirte my first review! The Greatest Hits CD-ROM collection gives children ages 3 to 8 an opportunity to explore and learn with their favorite Humongous Entertainment characters, including the peppy purple convertible Putt-Putt, underwater supersleuth Freddi Fish, and the world's youngest superhero, Pajama Sam. 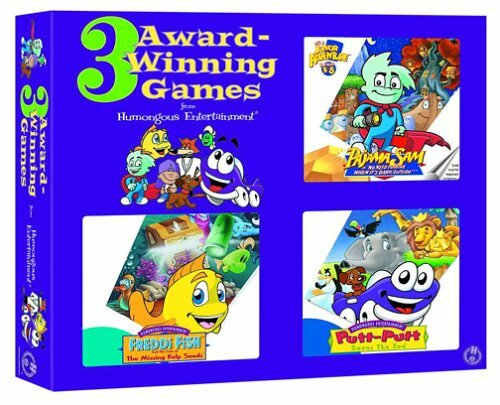 The Greatest Hits series features three software adventures: Putt-Putt Saves the Zoo, Freddi Fish and the Case of the Missing Kelp Seeds, and Pajama Sam in "No Need to Hide When It's Dark Outside". A fantastic bargain for three wonderful kids titles! My three year old daughter started out with Freddi Fish number 2. We now own all five Freddi Fish titles. This great pack comes with three cd's. Each cd is number one in the series for each character. All three main characters are really cute and easy to follow. The graphics are great on all the cd's, and each adventure has some great fun songs in them. In each scene, there are a lot of things to click on so that the kids really get good mouse practice. This is a great set to get for a child who is just starting out on the computer. An experienced user will love it too. Each title is good for a boy or a girl. We have over 20 kids games, and this set is by far the very best. My 5 year old son loves all of these games. We had a different Pajama Sam game which he loved and I couldn't pass up the deal offered here. I'm sure glad I got it. Humongous does a great job creating fun games with staying power. They are just hard enough to keep your attention, but easy enough not to be frustrating for a 5 year old. At this age, its unnecessary to get the newest games, as long as the games are new to the kids, that's all you need. These 3 games will provide months of entertainment at a great price. We bought this set for my son before he was 2 and he learned all the tricks in the Putt Putt game right away with me moving the mouse for him. Now he's a bit over 2 and he's learned how to use the mouse so he can do Putt Putt and Fredi Fish by himself. He doesn't always get everything right but he loves to play. The games are very creative and if the child doesn't click on the right thing, lots of funny things happen to whatever they click. He's still too young for Pajama Sam but some older friends of his love it. This is a terrific set at a great price. One tip: make sure you click on the topiary creatures before you go in the zoo in the Putt Putt game - there's a very cute song and dance they do. Just as much of a success as the Junior Arcade series! 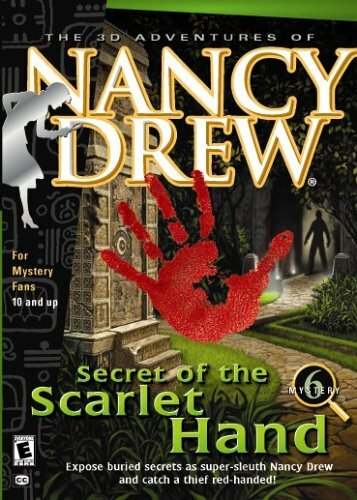 But after reading numerous reviews especially here on Amazon I realized that I had to pick up one of the Adventure series as my kids love the characters, and would be working on some problem-solving and observational skills, among other things. Plus I knew the humour would make the grown-ups laugh along with the little ones. I love knowing my son can play it again a second time with some of the puzzles changed, and a few "hidden" sections awaiting as well! It has better replay value than many games out there for the grown-ups! 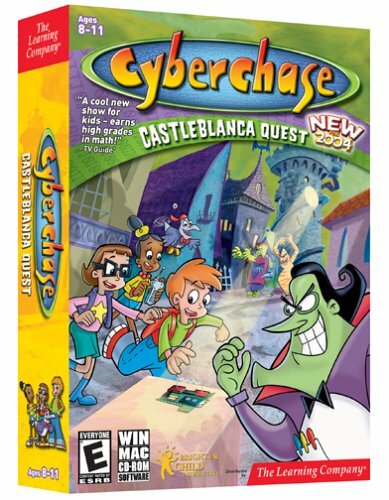 I highly recommend this collection, as well as any of the other Pajama Sam/Spy Fox/Freddi Fish/Putt-Putt titles for parents looking for wholesome, challenging, and occasionaly laugh-out-loud enjoyable kids games! I get a chance to relive my own youth (this title reminded me of playing King's Quest 1 and 2 back in my teens) while encouraging my kids to think creatively rather than just go through the same repetitious routine again and again like most games out there... What more could you ask for in a kid's game? Great entertainment, and good learning too. Get behind the controls of U.R.V., the Ultimate Robotic Vehicle, in Rescue Heroes: Tremor Trouble. An earthquake has hit the amusement park, and animals and people are in need of quick assistance. Players ages 4 to 7 can stop a runaway roller coaster, save animals from a flooding river, retrieve a downed submarine, and restart stalled high-wire trolley cars in this four-part adventure! 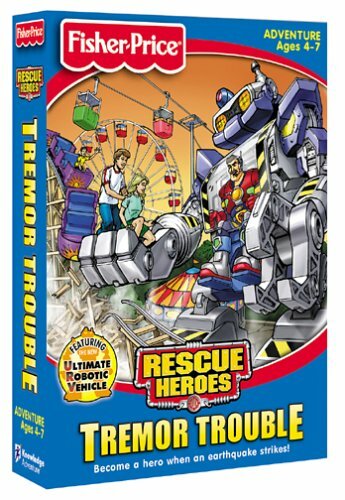 Even with three levels of difficulty, the activities in Tremor Trouble are simple, and children will have no trouble completing the game's tasks. The activities are basic skill builders. To put together the animal bridge, players must match up logs of varying lengths; to restart the stalled trolley, they match up gears of varying colors within its motor. One pleasing aspect of the game is that each of these four activities comes in two parts: the educational matching drill and an arcade game. To save the roller coaster, for example, U.R.V. must first put out the fires threatening to burn its structure. Only then can players sort out the machine pieces needed to rebuild the damaged ride. Meteors have hit the planet, resulting in a series of widely scattered emergencies that require the Rescue Heroes to intervene -- and they need your help!! The graphics are good, the intro is exciting .... but after that the game is totally mediocre. Four activities have three levels of difficulty, but they are quite tedious no matter what level you play. (1) Move around a water maze to rescue people in a flooded movie studio, and shoot a life preserver over a moving line of floating objects. (2) Navigate a maze on a rock face as you rescue stranded climbers while avoiding vicious eagles and snakes. (3) Aim a hose at brush fires so you can find and rescue animals on an African preserve. (4) Snowboard down a ski slope without hitting the shrubbery so you can dig people out from under an avalanche. The hype is here, but the games are very boring. Your child has little flexibility or independence when performing tasks, and those tasks probably use only 2% of your child's brain power. For example, in order to dig people out of the avalanche, you click on the snow cave over and over, it doesn't matter where, until the person trapped within tells you how great you are -- and every time it's the same person in the snow cave. Each game is rather mindless in this way. There is little reasoning required and no skills acquired. This is lame software that has neither educational value nor excitement. When there are so many worthwhile children's software titles out there, don't waste your money or your child's time on this lazy stuff. It may be worthwhile for the truly avid Rescue Heroes fan, but even that is doubtful. This was our first Rescue Heroes title. It is also our last. I gave this game to my son as an early birthday present. He's almost four and loves the Rescue Heroes. The reviews I read were mixed so I decided to buy it anyway. I'm really glad I did. Sure it's challenging, but it's a good excuse for the parents to get involved. First I did the hard parts for him, to show him what needed to be done. Then I guided him through them and finally he ended up doing it all by himself. He was so proud when he accomplished the hard tasks that he couldn't do at first! 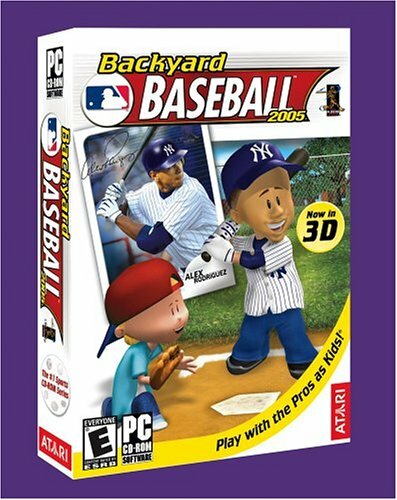 Unlike most computer games this one requires the use of the arrow keys instead of the mouse. Well, it's always nice to learn new skills. I can't wait to give my son the two other RH games I baught for his birthday. I have no doubt he'll love them too. I gave it a 1 because they did not have a 0, to give. I bought this game for my son and I try to install it and it tells me that it has encountered an error. I go to the web site and it tells me what to do with that error, but after I do what it told me it does the same error thing again. My son and I both got so frustrated and finally gave up. I am returning it to the place where I purchased it for a full refund. Good luck for those of you that also bought this Horrible Game. I agree with other reviews that the mouse clicking is very difficult. It's difficult to maneuver the men around. My son tried for a few minutes, became so frustrated, I finished the one mission, but couldn't get him to do any more. Would recommend the I Spy software - ages 6-10, but he loves it! Don't have to know how to read. My 7-year-old LOVES this game. He'd play from sun up to sun down if I let him. I hear him cheering and clapping in the other room and he's having so much fun! I'm VERY anti-violence, so when he got this game I was concerned. I was pleased to discover that although the ships sometimes fire on each other, no people are ever involved. This makes it so much more abstract and less about killing. When you capture forts, you fire on canons only and never see people. When you capture other ships, your knife is used only to chop up fruit that's thrown at you by skeletons. Once you capture their gold, you're on your way to fulfill another mission. Ollo is not only our family favorite game for our 4 year old, it also has turned into the neighborhood favorite. My daughter's 5 year old friend comes over to play it while my daughter is off doing something else! The chapters are great because the girls can go right to the activites they want. The open-ended marble game is also wonderful because it allows freeform exploration. The clickable areas are large, and although I had to play with my daughter the first dozen times we played it, she now has mastered the mouse at age 4 and can play it all by herself. 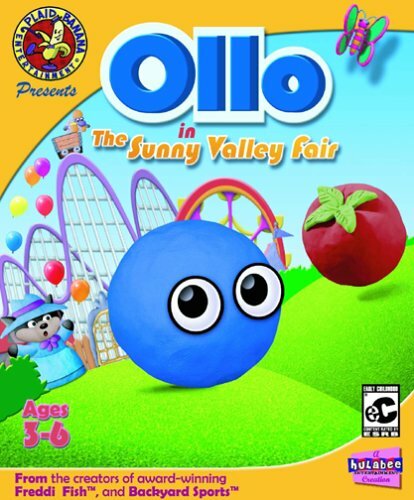 As an artist in a game-programming family (my husband is a game designer/programmer for a major playstation/xbox game maker), Ollo has impressed me with the quality of the visual style, and my husband with the straightforward interface design and carefully created activities and games that seem to exactly fit our daughter's interests and abilities. The game doesn't crash, it runs well, and most importantly, it's incredibly fun. A+, Hullabee! Keep up the great work! Make another Ollo! It's loads of fun. Both of my kids (4 & 6) loved the software. It requires planning and critical thinking, although it's a one-time-only game (it's exactly the same game the second, etc., time you play it). My 3 year old granddaughter really loves this game. She is a "do it myselfer" and needed very little help in learning to move around in this game. She is always very excited when she masters a new "chapter" She evens plays out "Ollo" with her toys. Telling them, now you can't go to chapter 2 until you finish chapter 1, etc. The game has helped her with reasoning skills- the giant tomato has knocked off the clown's wig, where is it. Then in another screen you see the wig being used by a bird as a nest. To get the wig, you need a ladder, and so, you have to find where the ladder is in another screen, unlock the shed - first finding the key to the shed, and take the ladder back to the tree before you can get the wig. She quickly learned how to move from screen to screen and back, and just really loves solving the different puzzles. My daughter is only 18 months old, but she LOVES Ollo, and asks to play every day. She obviously can't work the mouse, but she points at the monitor to let me know what she wants to do. After watching me play though it a couple of times, she knows where all the 'little fun stuff' is like the bugs that hop and count, or the birds that pop out of the bushes and tweet. She is able to walk me through Chapter 1, which includes getting a key, unlocking the shed, getting the net, and giving the net to the bunny. Beyond that, she just likes to point at things and have fun. She is also beginning to count, and learn colors and new words. In this game, she likes to say TOMATO, UP, DOWN, MAIL, DUCK, and especially BALLOON. She loves the opening song, hidden on the title page, too. I'll admit, I think this game music is better than most. For as many times as I've played Ollo, I still like the music. I also like the voice acting, which is better than many 'grownup' games I've played. Another thing that I personally like about this game is the look of it. Instead of a 'catoon' look, this game seems to be made of clay elements. It's a lot more attractive than many of the kids games I've tried. I will agree that the map is large, and some of the quest items are found in illogical places. But overall, we enjoy playing Ollo again and again. Age appropriateness is always an issue but this game requires basic mousing skills (dragging is the toughest chore) as well as listening and problem-solving skills. I needed to be there for the first and second rounds thru the game. But he is now self-sufficent. Reader Rabbit Kindergarten 2002 packs an astonishing number of activities into a two-CD-ROM set, enough to keep nearly any child in the 4 to 6 age range glued to the computer for hours. With glitzy graphics and plenty of songs to sing along with, not to mention a clever plot, this high-quality educational program helps kids practice a range of skills, from counting, reading, and listening comprehension, to recognizing colors and shapes. The adventure begins when Reader Rabbit and Sam the Lion are stranded in Balloon Town and must rescue the Dreamship, which has been encased in bubble wrap and locked in the Pointy Palace. In order to wake up the sleeping bull that guards the palace, the player must locate five musical instruments. Each time the player completes an activity, an instrument magically appears. For a program aimed at kindergartners, the instruments take a lot of persistence to earn--kids must complete a staggering number of problems at each activity site and this can quickly become very repetitive. The program itself is well thought out and comes with many user-friendly features. The software automatically adjusts to your level and shows how you're doing at each activity. It's also possible to save games for up to 99 different players, which makes the software suitable for use in a classroom or other group setting. The CD-ROM set includes three other activities--calendar making, painting, and music playing, all of which are engaging in their own right. 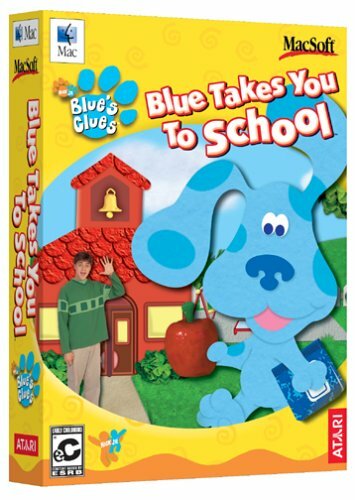 It also comes with a collection of more than 100 age-appropriate activities that don't have to do with the computer, as well as Reader Rabbit songs that can be played on an audio CD player. good for preschoolers if you want them using the computer! This program doesn't teach anything special that is not easily taught outside of a computer game. Success at the game will be had most quickly if the child already knows the skills needed to play the game (see below, i.e. already knows their basic shapes). If you want your child using the computer during the preschool years then this is a safe and good bet. If your child doesn't know everything this program covers already then they are sure to learn it quickly if they like the game and are not discouraged. There is much more to phonics than this program covers, of course. We held off introducing our son to the computer until he was almost 4.5 years old. We strictly limit what he can do on the computer and he does not use it much, sometimes going 2 months or so without using it. We purchased this program when our oldest just turned 5, at which time he already could start up the computer, open a program, change CDs and close the entire system down all by himself. I thought it best to buy an easier Reader Rabbit game and see how he likes it rather than start off with the Kindergarten or the phonics Reader Rabbit. If you have a 3 or a 4 year old (or even a 2 year old) that you want using a computer game then this one is great (see section on phonics for a possible difficult part though). Being unfamiliar with children's computer games I was surprised that much of this is almost like a video on television, there are songs that seem to be about 3 minutes long and very graphic and long introductions to the program every time it is started and before each game. The characters on screen tell the user what to do. I was disappointed it did not come with written instructions, as when my son needed help there was nothing I could turn to. Goodness knows I am not sitting with him all the time watching him play, so I miss the already-spoken instructions for the overall game. Instructions for the mini-games that they play can be repeated by simply clicking on a certain character on the screen. I sat down to play it as a new user and we played for over an hour. I was annoyed that the instructions are not clear. Specifically, the program has the user doing a little job to earn a gem called a brillite. They wanted 5 yellow brillites to start. We did all the jobs but there was a missing brillite. There was no instruction as to how to get this missing brillite so we re-explored every area on the program's map and began repeating jobs because we didn't know what else to do. That began earning us different colored brillites. It is a little unclear to me as to how to win this game, they say to gather brillites but we really don't know how many of each and how to exactly get them except play in a random manner repeating the games. I'd much prefer them to say "repeat all the games to earn the blue brillites in order to earn the missing yellow brillite" or some other such informative instruction. This is truly geared for preschool age (3 or 4) or for any age that already knows the 6 colors of the rainbow, circle, square, oval, triangle, diamond shapes, if they can count to 10 and follow oral directions. The hardest part of the game, which may be difficult for preschool aged children and may cause frustration, is the phonics portion. An object comes along on a raft and there are 3 sparkle shakers above it and the user must choose which sparkle shaker (with a letter on it) represents the first letter of the object. The first go round has the word written under the object (i.e. violin) but after that round is won the object comes out without a word. Shame on them for showing a giraffe and giving both a g and a j as options! Bad choice for beginners to phonics! The user will be told if they make an incorrect choice and they can narrow it down by process of elimination. The game with the train and matching the object shape is more of a fast paced game to improve hand and eye coordination and fast mouse-usage than a true matching game-if they pick the match right after the fast changes they are doomed. On the box it says this does drawing and coloring but that is a stretch: the kids are told to paint a certain shape a certain color and they simply click once on the proper color and click once on top of the shape and it is instantly colored in. There is nothing about drawing going on there! The only math here is counting up to 10 (it is advertised as having math on it). There is nothing offensive or questionable about this game, the language is clean, etc. This is a fun game for preschoolers (I found it too easy for my just turned 5 year old). It is very entertaining in that it has interludes in between games and songs with a few minutes of on screen entertainment. The songs are catchy. The graphics are very good compared to the old days of Space Invaders and such! 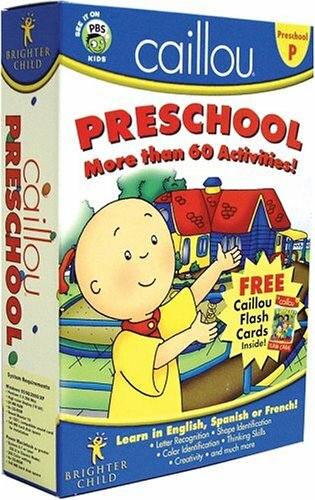 I purchased this program to help my 3 year old son sharpen and develop his basic preschool skills. 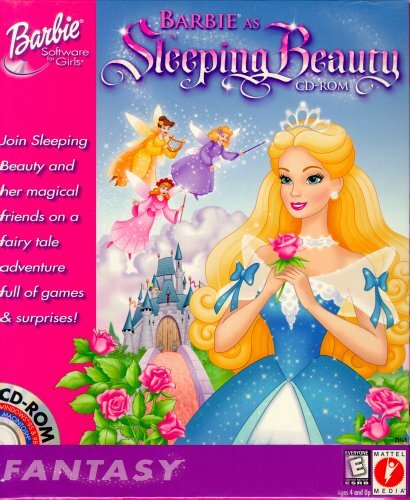 I found this program to have a good theme and my son was very interested in the character's various actions, songs and dances used to accompany the instruction. Skill levels can be chosen to pace the progression dependeing on the need of the child. The program is very user friendly to an adults helping their children. Progrmas are easily exited out of and information can be saved to log the progress of the children users. I recommend this software to parents who want to help their preschoolers get a head start on Kindergarten education. My son (now almost 4) is pretty academically bright and pretty good with a computer mouse. We bought this game for him just before he turned 3 last year. What a disappointment! Now, we are a big computer game family, and our son has played a few other titles which we have loved (Little People Discovery Airport, Ollo Saves the Fair, Putt-Putt, and a few others). 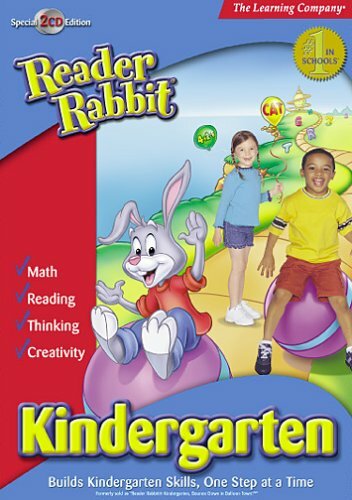 We loved Reader Rabbit Toddler and Reader Rabbit Baby, which were designed very well. Unfortunately, Reader Rabbit Preschool did not stack up. As usual, the game has a creative story behind it, and there is a goal that involves collecting things. These are wonderful motivators. However, the game skill levels seem either much to easy (matching bugs) or pretty advanced (counting out just the right number of bugs to fill a rocket, including addition and subtraction as the game increases in difficulty) for a "typical" preschooler. I should add that I used to teach preschool and kindergarten, so I have an idea of what is developmentally appropriate. This game ranges from boring to frustrating with very little in between. Some activities, such as the "painting" activity at the waterfall, require very very good mouse control, as the shapes tend to be very small, and the child must click in just the right areas. I highly recommend skipping this game. Our son is now happily playing Reader Rabbit Kindergarten (the Summer Camp one)with very little trouble. I had previously purchased Reader Rabbit for baby and toddler and was thrilled with the product. However, I cannot say the same of the Reader Rabbit Preschool. This CD launches with a page that gives my [child] 6 choices of where to go. Only one is the educational program. The others are advertisements for Star Flyers, Clue Finders, Zoombinis, the Oregan Trail, and Carmen Sandiego. Each of these plays a short movie and gives my [child] the option of launching the internet to download more. I certainly do not want my child on the internet, and I did not purchase the CD so that the Learning Company could target my ...child with advertisement. I wanted him to learn something. It quickly became a fight to keep him in the educational portion of the CD. I called Broderbund, and after waiting 25 minutes to speak with a technician, was told that there was nothing that could be done. There are no parental controls. I asked to speak with a supervisor to discuss my concerns, and was told I could go to the web site and e-mail them. I would not recommend this CD. My daughter, 5, loves to play this game. She dresses up the animals in very creative ways and feeds them too. The game holds her attention over many other "fancier" type programs. She loves to bathe the dogs and give them a check-up too. She even prints out her creations. Best of all, this is a game that she can do by herself. A lot of other games seem to be a bit difficult for her age. This one is truly for young kids.I would say that this game is worth the money. My 7 year old daughter got this last year for christmas and she still sits and plays it all the time. You pick your own animals and set up your pet shop, then you care for your pets, groom them, and dress them up. Her favorite thing about this I think is the music she is always singing along with it. My 3 1/2 year old son likes this too it's easy for him to play it all by himself. I'm actually buying a replacement CD. 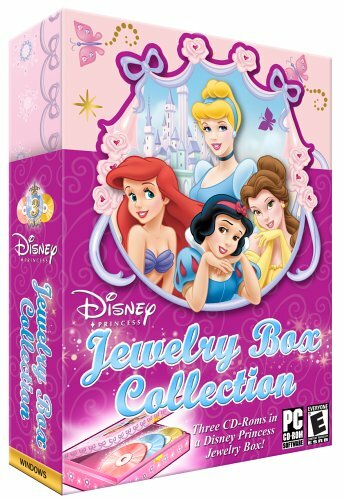 My oldest daughter loved this, now my youngest daughter loves it but it got too scratched. It's great because it's so easy for them to learn and they can play it without getting frustrated (and I don't have to bail them out!) The song is nice, it's not violent, it teaches compassion and both of my girls now want to be veterinarians. My youngest was 3 when she first played this, now she's 5 and has a lot of other newer computer games but still likes to go back and play this one -- hence, the replacement CD. I got this game last year for my 3 year old son. He loved it so much. ... My 7 year old daughter really enjoyed playing the game too. This is the WORST GAME EVER. (...)i couldn,t even make it through the first level of this "ages 6 and up" game. There was this thing called virtual training at the beggining,and it was really fun,but once you started the real thing,it was impossible. In the real thing,there were all kinds of new obstacles,like animals.Plus,you had to remember the different key combinations for running and jumping (ect. ),and you had to jump at exactly the right time.there are only two good things i can say about this,virtual training,and it works on windows XP.Don't make the mistake i did in buying this game. My 6-yr-old daughter loves this game but definitely needs help with a lot of it, even on the easiest level. She was at first disappointed that she couldn't use the mouse but once she got the hang of the necessary keys she was off and running. Rolling, jumping, swinging, climbing, different lands and terrain, things to push and pull, things to avoid or collect... all of it is great fun! A much faster pace than the Secret Agent game, and thankfully none of those silly costume changes between "action" and "stealth" modes. This is a game we'll be able to play for years to come. This game is rated for ages 6 and up, but even at the easiest level, it was so difficult, my 9-year-old was in tears. It's a beloved children's classic in a brand-new format, and kids are sure to love all the new music, games, and creative activities on this CD. 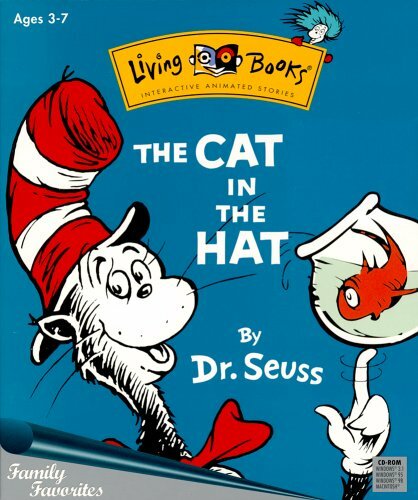 Throughout the software, The Cat in the Hat is read aloud by a narrator, and children are presented with two choices: follow along with the story or play with the games and clickables hidden on every page. Games are designed simply, and preschoolers will be able to master them without much difficulty (older children may find them a bit too easy to bother with repeat play). Throughout the story narration, early readers will benefit from seeing the highlighted words on each page--they're repeated frequently. It's a great way to foster word recognition. This software also teaches toddlers how to get the hang of using a mouse. They're encouraged to turn "pages" by clicking on the Cat's glove icon; they'll find this action easy and instantly gratifying, since kids can click anywhere in the vicinity and still receive hilarious results. The Cat in the Hat is Alive! I recommend this interactive book to anyone with small children. My 4 year old loves the read and play portion of the program. My 2 year old, who doesn't sit still long enough to catch her breath turns on the computer and insists on Cat in the Hat. As she is not quite old enough to handle the mouse on her own, I click the read segment for her. She sits through the entire book laughing at the Cat's silly antics, repeating words, and humming along with the music. It is the best of both worlds, a classic children's story come alive. My 3 1/2 year old son is already a huge fan of Dr. Seuss. I bought the software because he loved the book so much and he was delighted. A child can choose to have the computer read the book to them or they can choose to play along. When they play along, it stops on certain screens and allows the child to click and interact with the characters and text. For example they can help the Cat in the Hat clean up his mess by clicking on the scattered items on the floor. My son is constantly saying "Mommy watch this...". I couldn't pull him away from this game when we first brought it home. He still pulls this game out quite often. The best part is that he still loves all the Dr. Seuss books. The software won't take away from the traditional form of Dr. Seuss.